There’s a new way for Jumpstart members to initially set up and reset their password for MyJstart in Oops, our online password reset program! This new method does not depend on encrypted emails or answering any security questions. All member cell phone information (filled in on their application) has been connected to the specific member, allowing them to get a text message with a token that will let them initially set up and/or reset their password online. 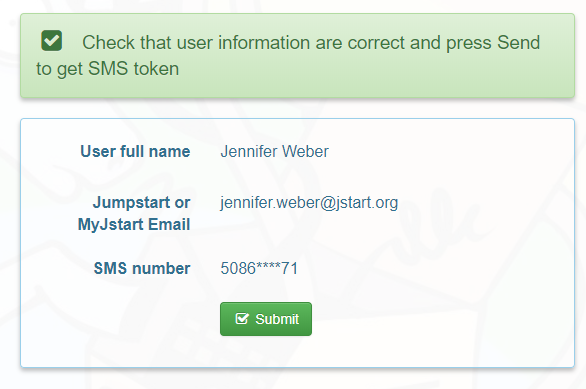 The member should go to https://oops.jstart.org/ and enter the email address where they received their MyJstart invitation (the email that they use to log into MyJstart) in the reset code by text message option. Click the Start Reset button. A screen will pop up stating the user’s full name, the email address, and a partial view of the member’s phone number. This information should be carefully reviewed. If it is correct, click the Submit button. The next screen will note that a text message – an SMS – has been set, and a window will prompt the member to enter the numbers – the token – that they have received in the test message. It’s important to note that the token sent via email is NOT the new password – the token allows the user to get to the next screen and create a new password. The text message will come up as being sent by 617-652-5867. Standard text messaging rates apply to these texts. After entering the token numbers sent via text, the screen will prompt the member to enter a new password. Enter the password according to the guidelines, and then enter it again to confirm. 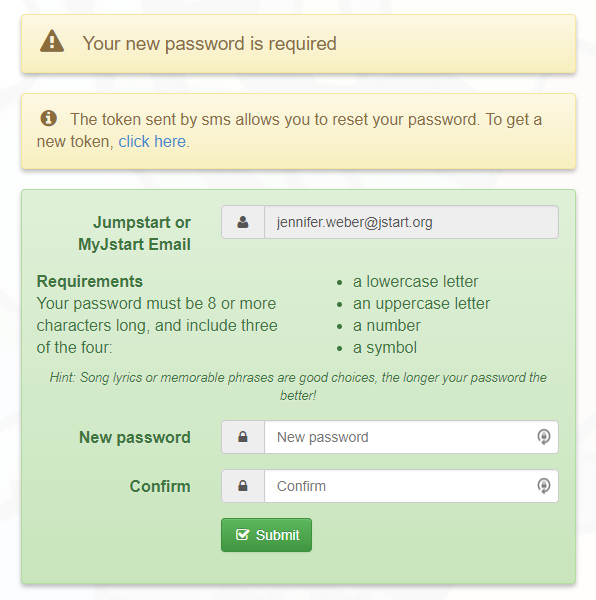 Members can then go to https://my.jstart.org and log in with their new password! What happens if the system can’t find my cell number, or the number that comes up for confirmation is one I no longer use? There are a couple of options – if you did create a Oops account and register security questions, you can use those questions to access your account and create a new password. Directions on this process are explained here. If you did not already create an account in Oops, this method will not work for you. Go to your site manager, quality coach or volunteer manager, and ask that your cell number be updated in our system. After they have done that for you, they will need to email lms@jstart.org to note the update. After the process is complete, a message will be sent to the site staffer (and the member, if we have the email) noting that they are ready to try to SMS reset method again. © Copyright 2019 Jumpstart for Young Children. All Rights Reserved.